Ever since Simon came out with with Birthday Farm Animals stamp set a few years ago I’ve been wanting to get it and use for some fun Birthday cards. I finally got it a month or so ago and since I was in a Holiday mood I decided to stretch it and use it not the way it was intended. Instead of making yet another Christmas project I decided to go for a New Year theme. I hardly ever make any New Year cards and truth be told I found only one sentiment in my stash that reads Happy New Year. I stamped the bird image along with a few balloons from the Critter Accessories stamp set in Simon’s Intense Black ink and colored using Copic markers. Copics seem to be my go to medium these days (even though I finally bought myself a 150 set of Prismacolor Pencils, woot woot!). 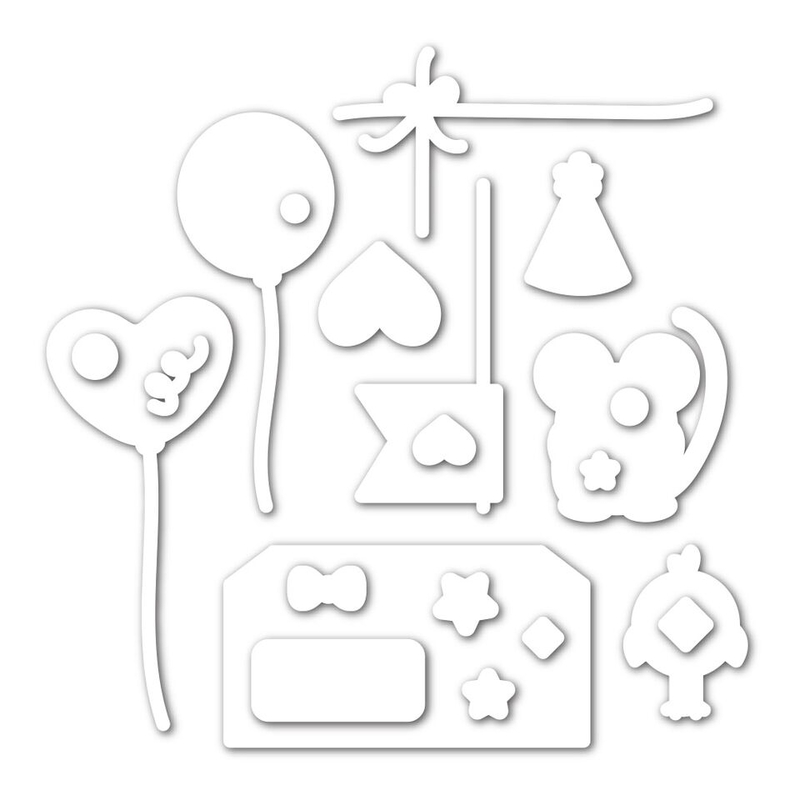 I cut images out using coordinating dies and also cut balloon shapes out of white self adhesive fun foam (I use regular white foam and add Stick it on both sides to make it self adhesive, than die cut any shapes out) for some extra support and dimension. I knew I wanted to add glossy accents over balloons to make them look glossy and shiny and I didn’t want the paper to curl up (it usually does from that much glossy accents, I tend to put very heavy coat) so this is why I needed to cut identical shapes out of fun foam, foam adhesive would have not done the trick here. 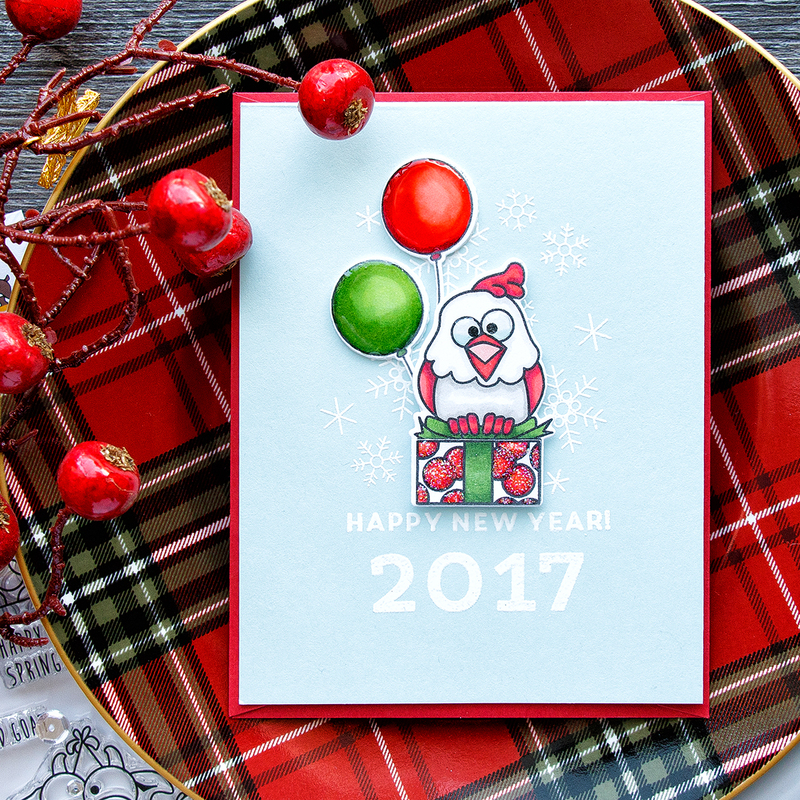 I also stamped a simple snowflake background and heat embossed Happy New Year 2017 in white embossing powder on Simon’s Sea Glass A2 top folding card base. In my photo it looks like the card base is red and blue is just a panel adhered over it; the red in the photo is Simon’s V-flap envelope (I am now trying to pair my cards with envelopes as I make them, hence more envelopes in my photos). I foam mounted my images using foam adhesive and die cut foam shapes for the balloons, added Star Dust stickles to the red dots on the present (I don’t have any red stickles, so I always use my clear) and finally added a generous amount of glossy accents to the balloons and the eyes of the bird. I too had only one stamp that was for New Year’s. How did that happen with our multitude of stamp sets? LOL! This is so much Yana! I don’t usually send New Year cards either as I mention the new year on my Christmas cards! 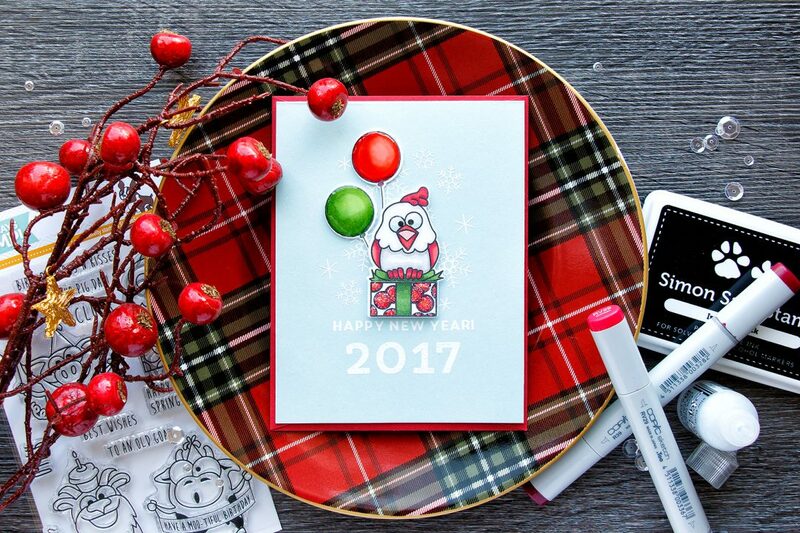 However, this is a darling card – I may change my mind about New Year cards!!! So awesome Yana. 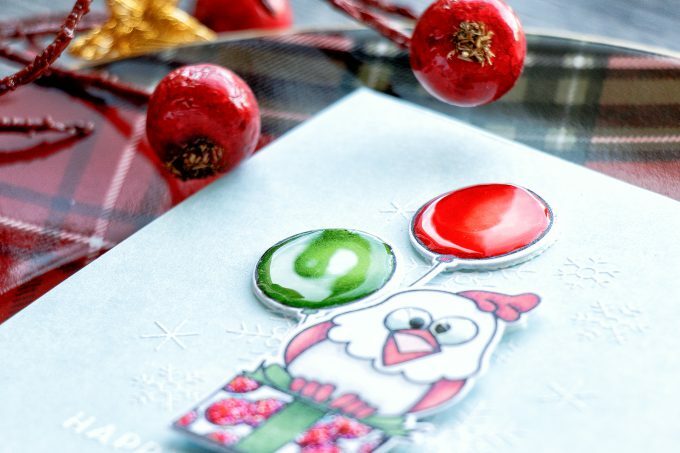 I only have two New Year stamps but I seldom use them, maybe I should send those this year. Hahaha! I just can’t! This bird is so funny! This year you definitely all set of holiday critters. Love this colorful bird against blue background, so stylish and pretty! Yana, I love the combination of all the colors you used. The blue card stock with snowflakes mounted onto red card stock. A perfect happy new year 2017 card. I love your work and anxiously await each post :-). 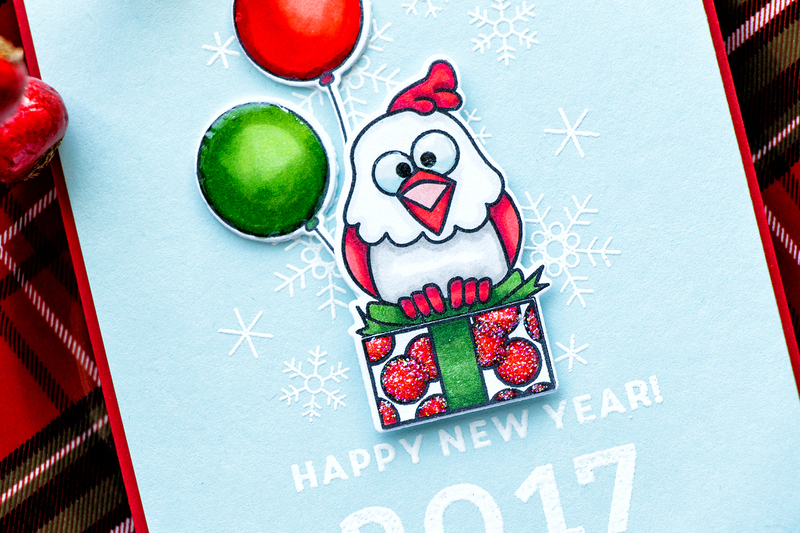 This card is laugh out loud adorable – and I mean that literally – my husband and I both laughed aloud at this funky chicken. Love the card! Thanks for the inspiration!